Cutting Mat with Craft Knife & Ruler Set!! Great Deal!! Cutting mat, knife set, and ruler all in one place for you. We have created this set specifically designed for you! Our package comes with a 18X12 self healing double sided cutting mat, precision stainless steel hobby knife, 10 easy replacement craft blades, and a steel corked backed ruler. No more hopping from store to store trying to gather all the materials you need. Take less time hunting and more time completing your projects. Know You Have Reliable High Quality Materials for any Project. Unlike other rotary cutter mats, our 18X12 cutting mats for sewing and crafts are made of 5-ply PVC construction that withstand sharp X-ACTO knife cuts and rotary cutter slices repeatedly without losing form or harming your surfaces. Our knives are designed for ultimate precision and control with scalpel sharp blades and light weight handle. Our 18" rulers are high quality steel and designed for stability. Our Precision stainless steel blades are scalpel sharp letting you trim slice cut and dice through paper fabric plastic and even thin metal easily. Precision Means No Accidents. Each craft blade is packed in a plastic reusable container. You will always have some place to safely store your slightly used blades and dispose worn-out ones. These utility cutter blades will fit all X-ACTO blades further adding longevity to your X-ACTO knife and other utility and hobby knives. Precision Ruler that will Last. Our stainless steel corked back ruler is rust proof for long lasting performance. The non-slip cork bottom on the steel rulers prevent damage and resist slipping and etching. 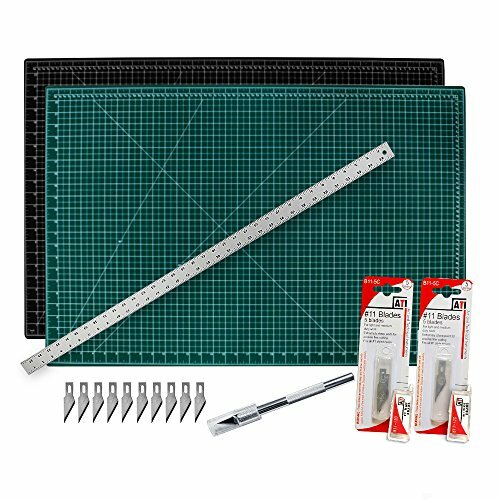 Our cutting Mat with craft knife and ruler set is ideal for many professions and hobbies. No matter the task or project our set was created with you in mind. A multiuse set that will lend itself handy both for past time projects and building career changing designs.